Give your home a touch of something special with Whitmor's Split Rattique Wastebasket™. An attractive addition to any space as a wastebasket or for storage, this weaved wastebasket fits in any room. A space-efficient design with unique texture, the wastebasket will add a dash of rustic charm to your space. Toss away the trash and clutter with this woven wastebasket. Perfect for placing inconspicuously under the desk in the home office, in the bedroom, or under the sink in the bathroom. 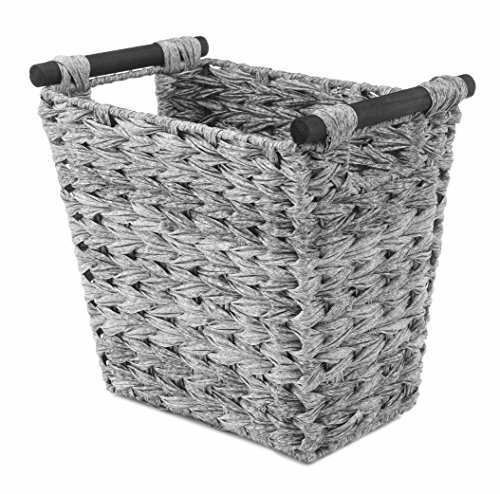 Woven PO Rush with wooden handles, this trash basket measures 12.5"L x 8.0"W x 11.811"H. Whitmor is a 4th generation family-owned and operated business. Since 1946, Whitmor has been dedicated to bringing organization home by creating products that simplify everyday life. Ensuring that those products are built with integrity, value, and innovation is our commitment to you. And our promise is that we will always be here for you should you ever need us as we stand behind our product 100%. Whitmor customer service is available in English and Spanish Monday through Friday from 8am - 4:30pm CST. Call us and we will gladly assist you in your language. You may contact Whitmor toll-free at 1-888-944-8667 or via email at customer_service@whitmor.com.